It’s a New Year! Welcome to 2017. I have spent my Christmas Break in the company of my extended family by the beach. It’s been a bit of fun. We had a Boxing Day Sail, but no Boxing Day Sales were attended. I’m sure I missed out on a bargain or two, but it has been enjoyable recharging the batteries of the soul at the end of a busy year. Our first few days after Christmas were warm and sunny: around 35ºC( 95º F). This was great for getting out and about, and enjoying the weather. 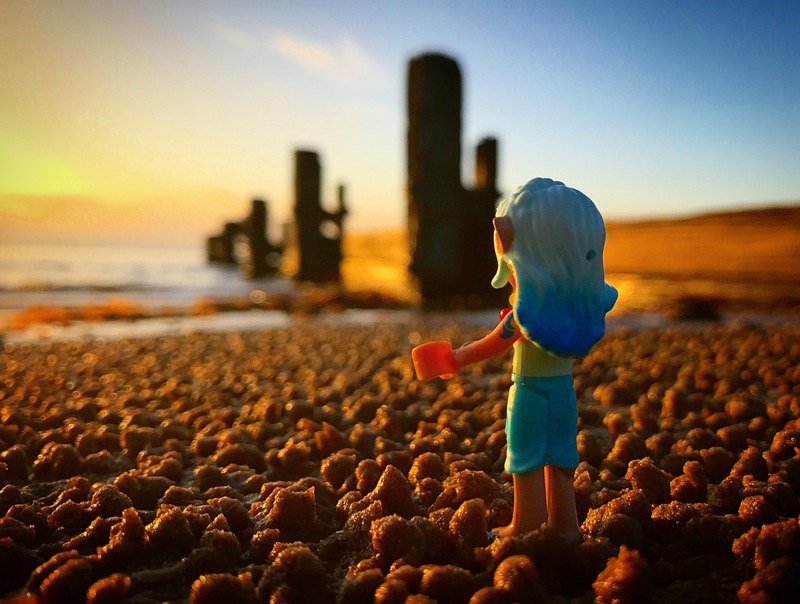 Early morning sunrise walks with awesome light – just the place to take some minifigures for a photo shoot. You may have seen some on the Rambling Brick Instagram Feed. While the first few days after Christmas were great for outside activities, the third was a little different. The day started grey. There was no sunrise, and a light drizzle. No good light. Photo opportunities were seriously curtailed. The rain got a little heavier and I made an executive decision: I would build all the LEGO sets that I received for Christmas. This is not as hard as it seems. I received only one LEGO® set for Christmas: the Creator Expert Volkswagen Beetle (10252). I thought I had bought this set earlier in the year…but it had vanished from my storage space. The mind can play tricks on you I guess. I was excited to get this set, as it resonated with some family history. Here is a picture of my Dad. He arrived in Australia in the mid 1960’s and bought a VW beetle and a surfboard. During the summer, he proceeded to work around a few coastal regions. Before long, he met my mother and after a while they got married. I was born the following year. The Beetle was gone, and they bought a Holden station wagon. As I grew up, Dad was managing a shop in country Victoria. Amongst other things in the shop, there was a toy department. LEGO® sets were sold here. They also had a play table full of LEGO® bricks, and ran building competitions during the school holidays. This was in 1974: before mini figures or LEGOland sets existed as a concept. No town, no castle, no space! But I digress. A few years ago, these photographs of Dad resurfaced. Proudly modelling his duck egg blue VW Beetle. So, you can probably understand why I was a little excited when the VW Beetle was announced back in the middle of the year. While not quite dark azure, and missing the cooler on the roof, it still evoked memories of these images. I ordered it through shop.LEGO.com during the year, but nothing happened with it once it arrived. Well, quite a few things happened: Life got in the way. A lot. ‘Sets I don’t get around to building!’ is often my reply. And so Christmas came. I received one set for Christmas from my friends and family. I’m quite happy with that. The VW Beetle. Nice. The Summer Activities set in, and there was much to do, but very little related to LEGO Sets. For the first three days after Christmas anyway. It was cloudy, humid, and warm. And raining. Quite a lot. So I decided to open up the Christmas LEGO Set and put it together. Perhaps to take to the beach during the week. Perhaps to display. Perhaps to put on the shelf next to the family photo’s along with the other toy VW vehicles on display. What can I say about this set that hasn’t already been said? I’m about six months behind the rest of the world in reviewing the Creator Expert Volkswagen Beetle. But I think it is very much a summer time set. It either works well as a reminder of summer, or just feels like it belongs if you build it during the summer holidays. When I set out to put a set together, I set myself up on the table. It has reasonable light. I use a large serving tray, in case I have to move out as my primary building surface. We are fortunate to a plain white tray that is quite large here. I empty large bags onto plates, and smaller bags ( such as those with small pieces ) into small bowls. There are a few new pieces in this set. Not necessarily exclusive, unless you count the extraordinary amount of Dark Azur(e). Here are a couple of pieces new to me. The Technic pieces allow an axle to run next to beams. The half rounded tiles are a better approximation for tail lights than square ones have been in the past. The angled wedge is an oldish piece (dating back to 2004), but this is possibly the first time I have used it. The curves and shape of the Beetle are a wonder to behold. So many interesting SNOT techniques. The emphasis in this model is Dark Azur(e) for the exterior, and Brick Yellow/Tan for the seats. There are a few stickers in this set. My feelings on stickers have been discussed previously. This is, however, very much a display model: the stickers play a role in providing some of the pillars in the car, and giving a curve to the back windows. The surf shop stickers add extra character to the build. So I have applied them. This was a satisfying build. It took me around three and a half hours to build, with interruptions for morning tea, lunch and the Doctor Who Christmas special. It is full of Dark Azure Bricks, tiles and offset plates. The final model is fairly solid, despite some of the SNOT techniques feeling a little flimsy during assembly. In fact there are so many creative SNOT (Studs not on top) techniques in use here, I lost track of the ways they were used. The curve of the bonnet is nicely recreated with the gently angulated panel, attached to the top part with lots of curved bricks. The shape of the tubing over the bonnet helps maintain the feel of the curve. As I said, this set just feels like Summer in a Box: Sunshine and balmy breezes in ABS form! The beach was not far, and dinner wasn’t yet ready, so I took the VW down for a few quick pictures in the sand. It was around 6pm on the evening, and another 2 1/2 hours of daylight remained for the day. Perhaps it was a little more harsh than I may have hoped. Still, it looked a little more in place at the beach than it did on the table. The dinner bell rang, and I headed home. But I had the feeling something was missing from the picture. ‘It looks good, but how did it get there?’ Dad asked. Tread marks you say? Challenge accepted! The light had now gone. So in the morning I got up with the intention of catching the sunrise. Summer sunrise between Christmas and New Year, in southern Victoria, Australia occurs just before 6:00am. So much for a casual holiday sleep in. Here is an unprocessed, as it happened (albeit slightly cropped) photo as I arrived on the beach. The half hour before sunrise is awesome. Let us not discuss the foreboding that red sky in the morning brings. Unfortunately, after the sun rose, all of the colour went, and there was little direct light for a while. After a few minutes, we had adequate light to work with. But still there was something missing: ultimately I found what we needed to give the model some life. I had some minidolls in my minifigure case (which I carry with me when I go to the beach in the morning incase the light is awesome). In this case it was the Elves Azari and Naida. Just the perfect couple of hippy chicks to be going on a road trip along the coast with their VW Beetle. Now, a lot can be said about the limitations of these figures, from unrealistic body shapes, no wrist movement, and the lack of independent leg movement. But they are significantly taller than your typical minifigure, and so a little easier to match with this model for scale. so I thought I’d try to get some forced perspective happening. Normally for this technique, I put a large scale in the front, with smaller scale models behind to give the impression of everything moving more rapidly towards a vanishing point. Here the challenge was to make the figures appear bigger than they were, so they would fit with the car. I am not sure if I pulled it off completely, but it seems an improvement. The light was not as inviting as it had been on recent mornings, so in order to make it interesting, I took the team down to the rock pools. Reflections are quite nice to bring out a little life in pictures. So… I have returned home to work, the beach is far away and I missed my great sunrise with the VW. But still, it certainly looks in the right place by the water! Perhaps I’ll try to make a mainland scale version of Dad, and take them all down next time I get to the beach. Time will tell. This was a really satisfying build: the techniques involved certainly make it worthy of the ‘Creator Expert’ label. The shape of the Beetle is well executed through the use of SNOT techniques. It also evokes images and feelings of halcyon days gone past. At $AUD150 it is not inexpensive, but I feel it is reasonable value for money.I award it 4.5/5 Arbitrary Praise Units. To get the 5, it would have needed a brick built figure to scale!